Install the Subaru OEM Navi head unit (model with 7" touchscreen, made by Kenwood) in any Impreza or Forester with the 20-pin radio harness. 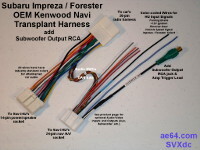 This harness is not needed in Subaru models that originally had the OEM Kenwood Navi or OEM HU with removable Tom-Tom Portable Navigation Device (PND). See notes and links below for additional considerations. 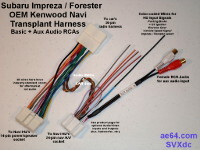 The above OEM navigation head unit made by Kenwood first appeared in 2008 Impreza and Forester models. They were offered in models up to 2011 (and some 2012s). For owners of cars with non-navigation OEM HUs, "transplanting" (retrofitting) these nav HUs has been a popular upgrade. Some 2011–up models got base-level HUs (similar to those in 2010) and would also work well. However, most models starting in 2011 received newer HUs with built-in Bluetooth and USB. Installing the Kenwood Navi into those cars is possible, but you'll run into some complications that you'll need to deal with (see "SWC" and "USB" notes, towards the end of this guide). Similarly, older Impreza/WRX/STi models up to 2007 and Forester through 2008 do not have a compatible CAN bus. Without CAN bus, navigation will still work (and all of the audio/video functions, of course), but many of the HU's car data features won't be available. For details, see Subaru's owner's manuals. The navigation manuals are supplements (separate from) the general manuals for the car. 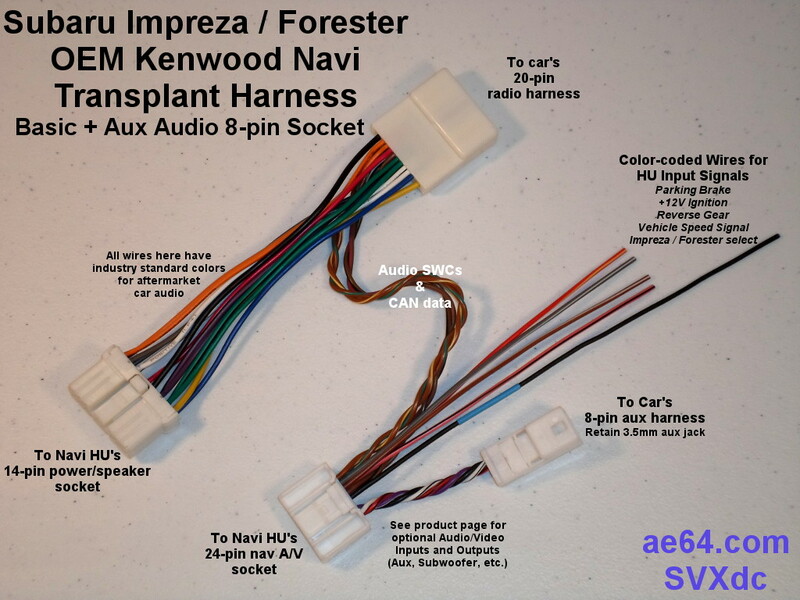 Find the OEM Kenwood Navi manuals from applicable models/years. For newer cars with the phone/BT buttons and USB, you may be happier with the newer OEM Fujitsu Ten navigation. See this page. I had factories make several of the components I use to build the harnesses, including the 20-to-14 pin assembly. All of the wires have terminals directly crimped onto the ends (no soldered joints). All of the optional RCA cables have larger (and sturdier) wires than the tiny, fragile core wires that you'll find in most other RCA cables out there. Price for the basic transplant harness is $29. 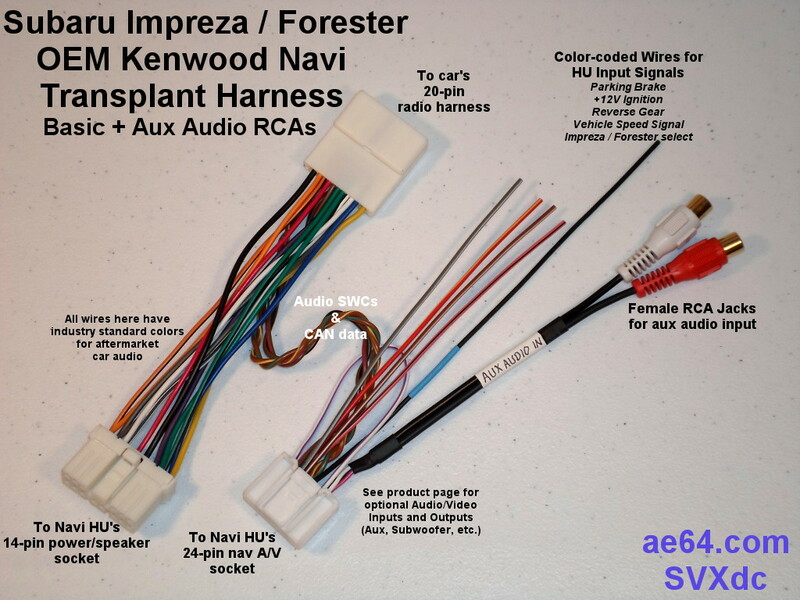 For installation into an older Impreza or Forester (which already have the 14-pin radio harness for power and speakers), I can provide the 24-pin reverse harness separately. Note that the face of the Navi HU is larger than the standard double-DIN size dash opening in those older models — you will have to make a significant modification to your dash fascia. Price for the base version of the 24-pin harness (without SWC, CAN, or any A/V input/output wires) is $16. For a custom version of the 24-pin harness for other applications (different cars and/or HUs), e-mail me details of what you would like to do. I'll want to see a factory diagram (pin-out and/or wiring diagram) for the car or HU. In cars where the Navi was installed by the factory, the aux audio and video inputs are connected to 3 female A/V RCA jacks in the center console. 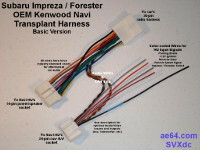 You may order the basic transplant harness or separate Navi reverse 24-pin harness with any of the following additions. Choose one configuration from box "A", and optionally add choices from boxes "B", "C", and "D". Choose carefully! Although it's possible to extract the A/V wires to switch to a different configuration down the road, many people find that difficult to do (so you may end up needing to send the harness back to me for the change). Also optionally add the 8-pin rear camera harness ("E"). Line-level (low level) left/right stereo input — Use for portable MP3 player or any other device with audio you want to hear. Default on basic transplant harness (no extra charge). You can easily add any of the other aux audio options later. Choose either of these options if your car has the factory 3.5 mm aux jack (in the armrest center console) and you would like to retain that as the audio portion of the Navi's A/V aux input. Your car's factory aux harness (the end that is currently plugged into the rear of your OEM HU) will plug into this socket. The car's 8- or 16-pin harness and 3.5mm jack support stereo audio only. It does not support aux video. Fits 2008–2010 Impreza/WRX/STi, and 2009–2010 Foresters that do not have phone/Bluetooth buttons on the steering wheel. Some later year cars have similar base-level HUs (without BT) which have the 8-pin aux. Add $10 (to basic transplant harness or separate 24-pin reverse Navi harness). Fits 2011–up Imprezas and Foresters that have phone/Bluetooth buttons on the steering wheel. See important notes below about SWC buttons and USB. Add $12 (to basic transplant harness). If you're not certain which type you need, tell me your OEM HU's model (find the number printed on the front). Or if your car is a base model that did not include the aux jack from the factory, I recommend getting the aux audio RCA jacks (next choice). 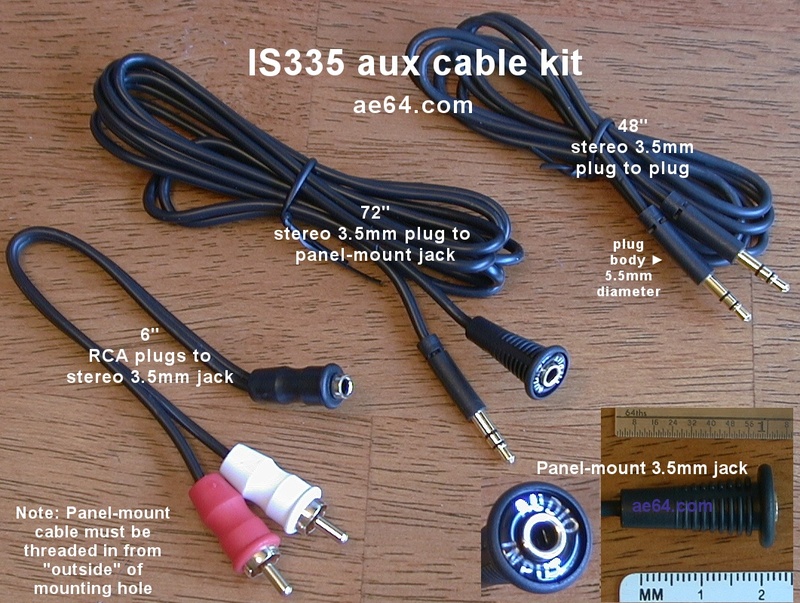 Optionally use this cable kit to add a panel-mount 3.5mm stereo aux jack to the blank panel in your center console ($15 for the "IS335" cable kit). Choose this option if you would like to have left+right RCA female jacks for the aux audio input. Cables are approximately 6" (15 cm) long. Includes Navi's aux enable lead looped back into another slot that provides ground (thus allowing you to select the aux source). 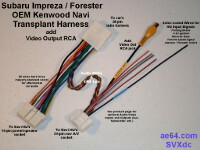 Add $10 (to basic transplant harness or separate 24-pin reverse Navi harness). Choose this option if you would like to customize the aux audio input with your own plug, jack, or other cable. Includes four wires (for left, right, ground/shield, and aux input enable). Wires are approximately 6" (15 cm) long. 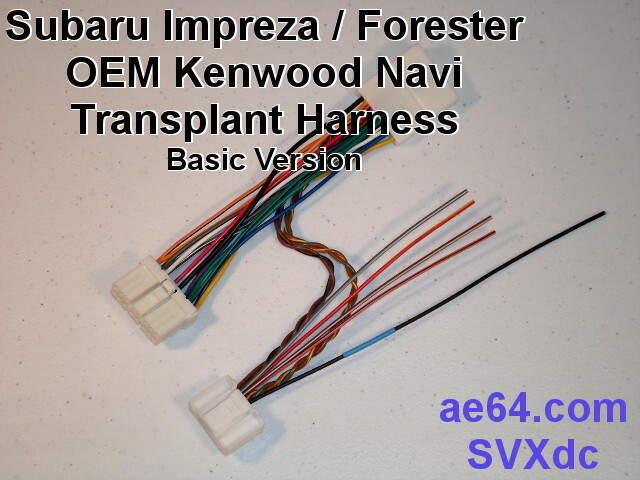 Add $6 (to basic transplant harness or separate 24-pin reverse Navi harness). Composite video input — Use (in conjunction with the aux audio input) for a digital camera, phone, game console, TV tuner, camcorder, portable DVD player, or any other device with video and audio that you want to see and hear. Note: It is not possible to view the aux video while continuing to hear the audio from one of the Navi's other sources (AM / FM radio, CD, satellite radio, etc.). Switching to aux mode switches to both the aux audio and video together. However, if you wish to use an audio-only aux source, the Navi has a menu option for that (so you don't get a black screen due to the lack of video). Default on basic transplant harness (no extra charge). You can add the aux video RCA jack later. Single RCA jack for the video portion of the aux A/V input. Cable is approximately 6" (15 cm) long. 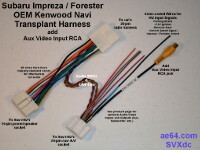 Add $8 (to basic transplant harness or separate 24-pin reverse Navi harness). 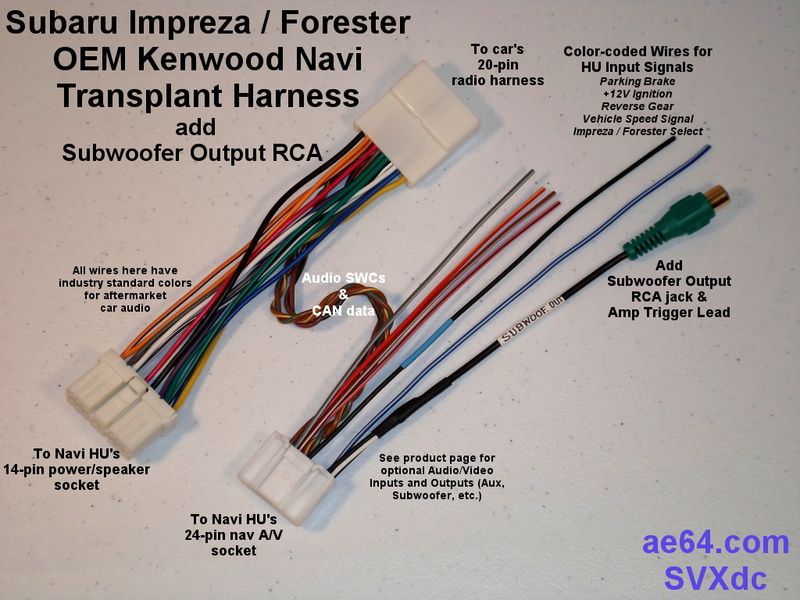 You may want this (along with audio RCA jacks) so you can extend all 3 to your center console, to fabricate something similar to the OEM configuration in cars with the Kenwood Navi HU (picture). Typically used for rear seat monitor screens. Could also be connected to a video projector to make your own drive-in movies, or to a video recorder. The Navi does not have any line-level audio outputs for the 4 main speaker channels. Default on basic transplant harness (no extra charge). You can add the video output RCA jack later. Single, yellow, female RCA jack for the Navi's video output. Cable is approximately 6" (15 cm) long. 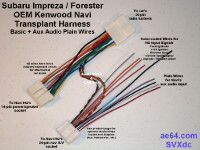 Add $8 (to basic transplant harness or separate 24-pin reverse Navi harness). Mono, line level output (low level, requires amplification) for a powered subwoofer or external amp + sub. The Navi has on-screen menus to adjust this sub output (see this forum thread). Default on basic transplant harness (no extra charge). You can add one of the other sub out options later. Single, green, female RCA jack for the Navi's sub output. Cable is approximately 6" (15 cm) long. Use to drive an aftermarket subwoofer. Includes 8" (20 cm) blue/white amp remote turn-on wire. 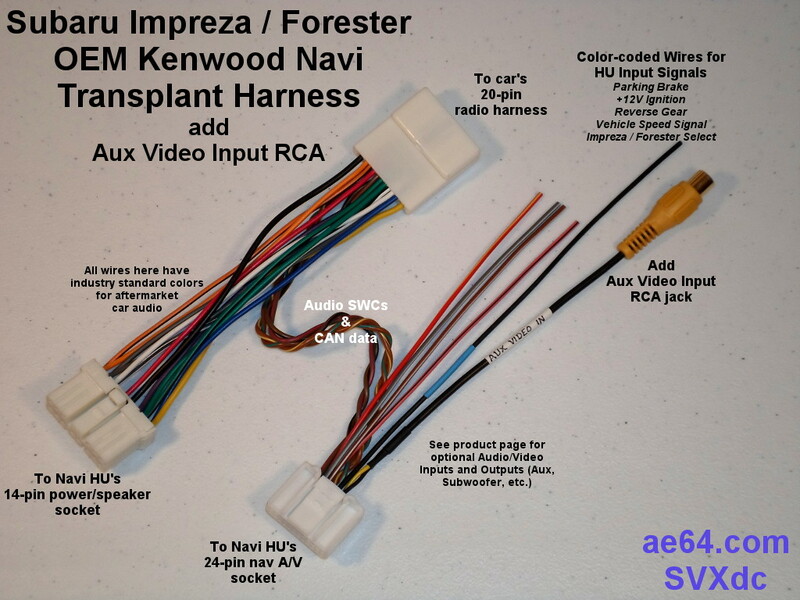 Add $13 (to basic transplant harness or separate 24-pin reverse Navi harness). If your sub amp requires signal into two RCA jacks, you'll need to add your own RCA Y-adapter. Some Foresters have an odd-shaped OEM under-seat subwoofer shown in this thread. The non-nav OEM HUs in those Foresters have a line-level sub output, on the same socket as the aux input. If your car has that odd-shaped sub, choose this option to connect the Navi's sub output to that sub. NOTE: This option is not needed if your car has the rectangular-shaped OEM sub or rear cargo OEM Kicker sub! Those subs tap off of a pair of the HU's main speaker outputs. They cannot be connected to the Navi's line-level subwoofer output. $10 if you're already including the 8- or 16-pin socket for aux audio. $12 if your car requires the 8-pin socket and you did not opt to connect the Navi's aux audio to there. $14 if your car requires the 16-pin socket and you did not opt to connect the Navi's aux audio to there. Connect a rear-view camera, which the Navi will display automatically when you shift into reverse. See this page. The Navi's rear camera input is always NTSC, even for HUs that were originally intended for cars in countries that use PAL. Note: Navi HUs that were installed in 2008 and 2009 car models do not provide the 6 Volt camera power supply and do not overlay the parking guide lines. However, people found that updating the maps adds the parking lines, so there is a small chance that activates the 6V output as well. I'd love to hear from someone who can test that. All harnesses are built to order. If you want something a little different, tell me what you would like to do. See my installation instructions for details (link below). All of the OEM Kenwood Navi HUs require the older-style steering wheel controls (with only 6 audio functions — volume up/down, track up/down, mode, and mute). If you have a 2008–up Impreza/WRX/STi or 2009–up Forester with no SWCs, your car is pre-wired from the wheel to the radio harness. Installing the OEM SWC "pod" in place of the blank panel is not too difficult. See this post. If your Impreza or Forester is a 2011 or later model with the phone/Bluetooth buttons (off-hook, on-hook, and talk), none of your SWC buttons will work with the Navi HU — not even the volume, tune, and mode buttons! The reason is because the SWC buttons have completely different resistor values than those in the older models. The easiest solution is to downgrade to the SWC buttons used on 2011–2012 models with the OEM Kenwood Navi. This swap is plug-and-play inside your steering wheel, and will work with my standard transplant harness (no special modifications needed). Alternatively, you could build your own custom device to interface between your car's SWCs and the Navi HU. I'm not aware of any off-the-shelf steering wheel interface modules that will talk to the OEM Navi HU. If you decide to try this approach, you should ask me to build the harness with the SWC wires broken out — with 3 on the 20-pin harness and 2 on the 24-pin harness. Unfortunately, I don't yet have a connector that fits the Navi's 5-pin Bluetooth microphone socket. For 2008–2009 Navi HU models, you can order the OEM microphone from a local or online Subaru parts dealer (part number H0018FG300, $125 list, or just under $100 online). You might search for the Kenwood KNA-VC300 microphone, which has the correct 5-pin plug (and is nearly plug-and-play — you'll just need to add a new pin/wire or relocate one of the existing pins). Or see this post for do-it-yourself instructions. 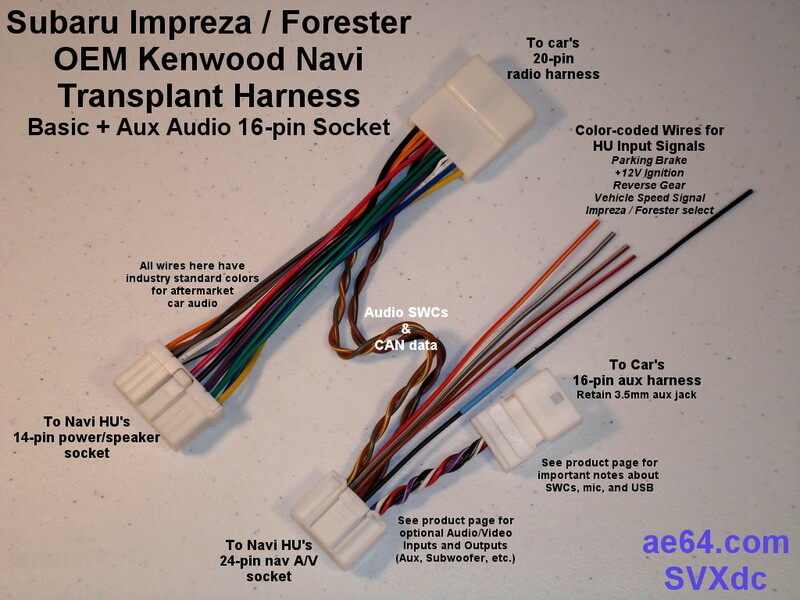 If your Navi HU came from a 2010 or later Impreza or Forester, you will need to retrofit the corresponding OEM amplified mic module (located in the map light cluster). You must use the mic from a car that had the 2010–up Kenwood Navi factory-installed. Although non-nav 2011–up models have a similar map light mic, a mic from a non-nav car will not work! Alternatively, design a mic and amp circuit equivalent to the OEM module. 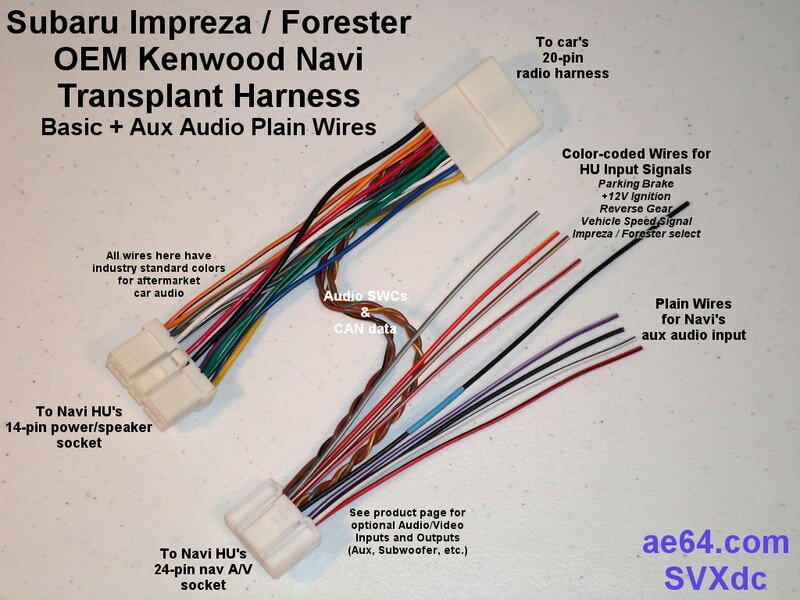 The Impreza and Forester OEM Kenwood Navi HUs do not do Bluetooth audio streaming. They only use BT for phone calls. The Impreza and Forester OEM Kenwood Navi HUs do not have USB capability built-in. So if your car has the factory USB socket next to the aux jack in your armrest center console, there is nowhere on the back of the Navi to connect that USB socket. Subaru offers an accessory called the "Media Hub." The kit consists of an interface module (which plugs into the 20-pin expansion bus port on the rear of the Navi), and a replacement aux "pod" for your armrest console. The new pod has an aux jack like what you had before, but also ads a USB socket. Navi HUs in 2011 car models were the earliest that were compatible with the Media Hub. See Subaru's page with information and FAQs. You should be able to order the kit from local dealers and online Subaru parts vendors, and often you'll also find them on eBay. Tell me if you plan to add that — I'll have additional tips. Prior to the Media Hub, Subaru offered an iPod interface that worked the same way, providing a cable with a 30-pin iPod dock plug, This kit was compatible with 2008–up Navi models. However, search for reviews before you buy either of those. When it hasn't been cut off, the Navi HU has Subaru's proprietary antenna connector (with a square, gray plastic shell and a tiny coax antenna cable). If your Impreza or Forester has the older-style, round Motorola plug, follow that cable back into your dash. Most 2008 and later models actually have Subaru's proprietary antenna plug, along with an OEM adapter to convert to the Motorola plug, Approximately 6 to 8 inches (15 to 20 cm) back from the Motorola plug, you should fund a junction of square, gray connectors (probably wrapped in a small square sheet of foam rubber). There is a release button on one side of the car's plug. Caution: Do not pull the coax antenna cables! The wires are somewhat fragile, and people have accidentally ripped them out of the crimped ends (or even out of the HU). If your car is an older model that does not have Subaru's antenna plug, you'll need a reverse antenna adapter (picture). I have those for $10. The Navi HU does require a GPS antenna for nav functions. The OEM GPS antenna is factory installed only on cars that have the OEM Navi HU. I do not have any for sale. If you opt to order an OEM antenna, it consists of two parts: The GPS antenna (with mounting bracket and a short "pigtail" cable), and a separate extension cable to reach the rear of the HU. Check with your Subaru parts vendor for the part numbers. UPDATED: If you buy an aftermarket GPS antenna, it must have an Eclipse-style plug. Here's one on eBay from a vendor in the US, with a good picture of the plug (I don't know anything about that vendor or the reliability of their antennas). I have seen antennas with the same plug from other vendors in Hong Kong. GPS antennas for some aftermarket Kenwood HUs have a plug with electrical contacts that will match the Navi's socket, but you will need to shave off a little bit of plastic from the plug. The same map discs are used by 2008–up Impreza, 2009–up Forester, and 2010–up Legacy/Outback. A Navi HU that has somehow been completely reset may require that you initially load software from a different DVD. See this post. Ask your local dealer — they may have a software disc that they will let you load while you're there. 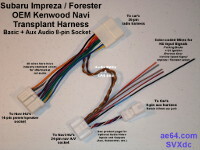 See my Subaru 24-pin Navi harness pin-out table for more information about the factory wires. See this post for compatibility issues between old (2008–2010) and 2011 cars and Navi HUs. Also see my installation instructions. Not sure what you need? Please e-mail me before ordering. Tell me your car's model and year, the model number printed on the front of the OEM HU that Subaru originally fitted in your car, and (if you've already obtained one), the Kenwood model number of the Navi HU (usually starts with FXD...).